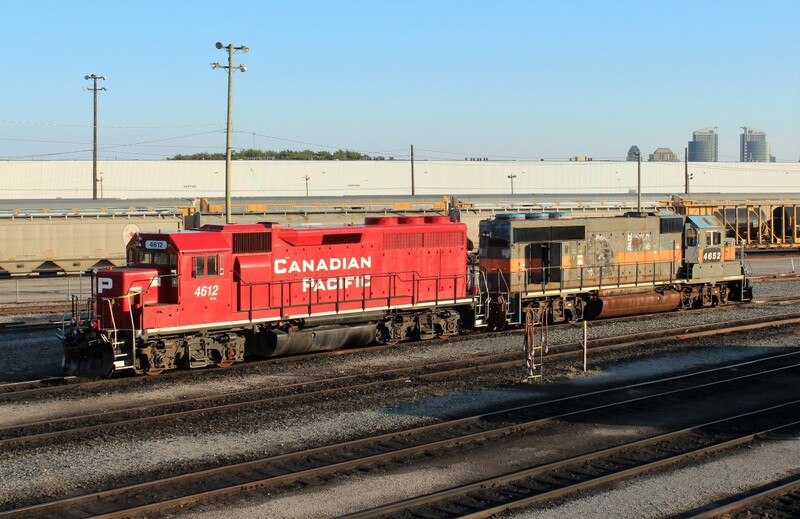 Railpictures.ca - Paul Santos Photo: Ex Milwaukee Road GP40 (#153 then #2026) marks it’s 10th year dressed up as CP 4612. | Railpictures.ca – Canadian Railway Photography – photographie ferroviaire Canadienne. Caption: Ex Milwaukee Road GP40 (#153 then #2026) marks it's 10th year dressed up as CP 4612. Wow! Excellent eye Marcus. So used to seeing DB blisters that you just naturally assume there is a fan on top. She looks pretty good for 52 years old, looks better than her 11 years younger stable mate. Interesting the dynamic brakes were deactivated and fan removed. Any idea if it will ever run again?